Coincidentally, by no fault of my own, I watched two debut films of prominent auteurs currently working in Hollywood. I’ve known of Terrence Malik’s Badlands the way I’ve known of David Lean’s Laurence of Arabia, a celebrated work of cinema that never quite intersected paths with me. On the other hand, Paul Thomas Anderson’s Hard Eight was vacant from ever even crossing into my consciousness. But, now I can boast that both films are exceptional works in cinema from two directors at the genesis of their careers learning to hone in on their own distinctive styles. Malik and Anderson are equally distinguished by their abilities to showcase entertaining, shocking tales that incorporates both the most despicable, yet admirable, parts of humanity in groundbreaking ways. An auteur is given the prestige of such a title based on their cinematic style and narrative structures. An auteur must have a consistent way of telling a story that if done by anyone else warrants accusations of copying or jacking. Hard Eight lays out Anderson’s future recognizable attention to detail in framing and color, while Badlands presents viewers with Malik’s taste for nature oriented long shots and collages of moments narrated by a character in voice over. These storytelling methods are common indicators of both director’s own definitive traits that are often replicated, but never duplicated. 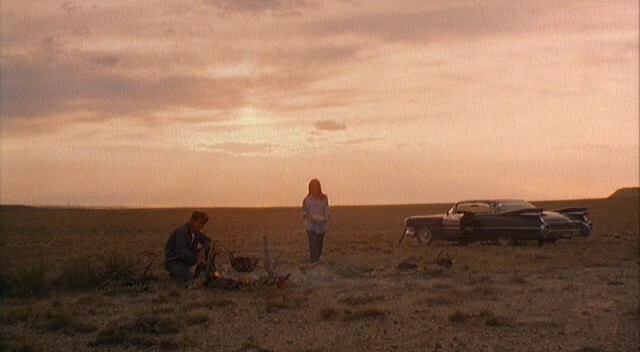 In fact, Badlands seems like a direct inspiration for Oliver Stone’s brazen, socially critical Natural Born Killers over two decades later, even down to its use of editing and diegetic sound. Malik’s 1973 debut pits Martin Sheen as Kit, a handsome, albeit psychologically damaged, garbage man with feelings of disregard and apathy for most of the world around him. Yet, desire and slight affection attracts Kit to a Holly (Sissy Spacek), a 15-year-old high school student bogged down by schoolwork and a domineering father. Kit becomes vexed by Holly and soon encourages her to run away and start a life with him. During their Bonnie and Clyde like venture—inspired by real events of nihilist Charles Starkweather and his 14-year-old girlfriend Carla—Kit compulsively kills almost anyone who stands in their way. As a protégé of director Arthur Penn, Malik’s debut speaks equally as a homage to Penn’s 1967 Bonnie and Clyde as well as a his own cemented style and auteurism. Similar to Bonnie and Clyde, Kit and Holly’s relationship is initiated by Kit’s lust and smooth talking parlaying to a young impressionable teenager looking for adventure that she doesn’t yet know she craves. Malik also picks up on Penn’s color theory by using basic primary colors to make the designated time period pop with temptation and attraction despite it’s drabness. In contrast to Penn’s work, Malik stands apart through his focus on existential themes that contemplate life and death, reality and fiction, and media created idols. These are themes explored multiple times throughout Malik’s career, along with his aesthetic of still shots of nature or placid sun drenched shots of characters engaging intimately and personally with one another over voice over as seen in his later films The Thin Red Line, Tree of Life, and New World. 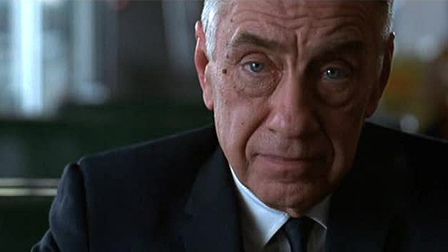 Anderson’s first feature film, Hard Eight, champions Phillip Baker Hall as Sydney, an elderly gambler with a secret. Through Anderson’s slow and steady tale we follow Sydney through the strange, decadent world of Las Vegas with his protégé, a once homeless and depressed man named John (John C. Reilly). Together John and Sydney are on the high road as gamblers in Vegas only to fall from grace at the arrival of a cocktail waitress and part-time prostitute (Gwyneth Paltrow) and a raunchy, fast talking criminal named Jimmy (Samuel L. Jackson) which spirals their adventures into a dangerous maze of lies, secrets, and murder. The story rolls quickly through a barrage of tight close-ups on characters framing them slightly off-center to the focal point of the camera. 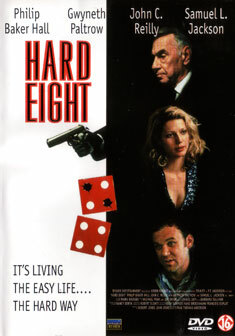 In fact, Anderson makes it a rare commodity for a character to fully be centered in Hard Eight adding an air of mistrust and uncertainty, thus correlating to the film’s overarching theme and revelations. Anderson’s use of tight framing is ever-present in his film making as his most recent release, The Master, showcases. Similar to The Master, There Will Be Blood, and even his second feature Boogie Nights, Anderson shows off his love of color palates drenching his films in simplistic basic primary colors. Hard Eight features many walls that are stark blue or red while clothing barely expands beyond black, white, and yellow. Hard Eight is the precursor to Anderson’s future blockbuster hit, and arguably his greatest film yet, Boogie Nights, in more ways than one, mostly due to his casting choices and aesthetics. 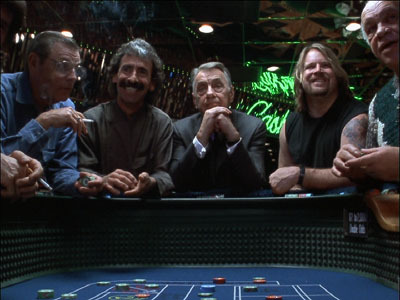 Major players from Boogie Nights have small, but tenacious, roles in Hard Eight contributing to the film’s entertainment and pace. The late Philip Seymour Hoffman who plays Scotty two years later in Boogie Nights appears in Hard Eight as a fast talking, arrogant competitor of Sydney during a game of craps. He spits out insults degrading Sydney for his choice to stay in the game leading to a tension filled scene in which the camera cuts between his proud pandering to Sydney’s annoyed, nearly defeated disposition, and the jumbling play of dice themselves. Robert Rigdley makes an appearance as does a haunting tune known as “Clementine’s Loop” that arouses thoughts of impending doom as it does in the brilliantly constructing robbery scene crosscut with Dirk Diggler’s downfall in Boogie Nights. 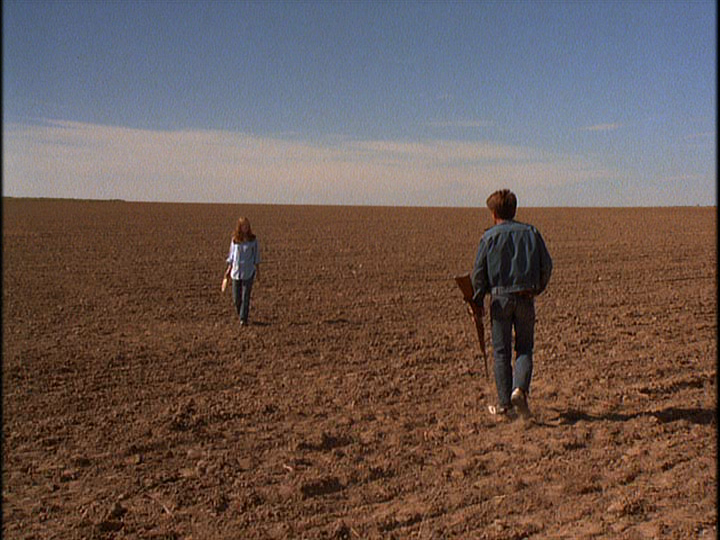 Malik’s love of establishing shots of nature in all its splendor is responsible for Badlands’ saturation of gorgeous mountain shots and the bare lands of the Midwest, while Anderson’s focal point is more centered on the characters he creates bringing audiences into intimate quarters with their struggles and decisions. 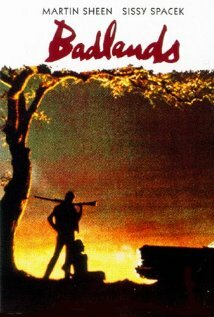 Both Badlands and Hard Eight are must see films for fans of either Terrence Malik or Paul Thomas Anderson respectively. For new comers of either director, these films are windows into their talents as directors and gives us insight into what their future careers will likely have in store. Though both men have styles that are recognizable, they never make the same film twice and each new picture introduces audiences to new themes to ponder and cinematic techniques to gander. For that I will continue to wait with anxious excitement for what these men have to offer. Badlands – SEE IT. And fall in love with the vast space of Midwest America. Hard Eight – SEE IT. And stay away for the luring danger of Vegas.